Kaze is the quartet formed by Satoko Fujii on piano and Peter Orins on drums, together with Natsuki Tamura and Christian Pruvost on trumpets. With the addition of pianist Sophie Agnel and drummer Didier Lasserre they become Trouble Kaze. As Orins explains in presenting the group, the moniker is a reference to the new configuration – a double trio or a triple duo, hence “trouble” – that also underlines the possible difficulties of expanding on a carefully balanced ensemble like the original quartet. Despite this was only the third time these musicians played as a sextet, the performance documented on this record, held at La Malterie in Lille, France, in June 2016, sounds as the work of a fully mature ensemble. The core band slightly alters its approach but maintains a strong identity, while Agnel and Lasserre perfectly understand the group’s dynamics and blend seamlessly in its peculiar sound world. Kaze means “wind” in Japanese, a hint to the unusual trumpet front-line that also functions as an oblique reference to one of the band’s typical traits, the tendency to patiently build sparse soundscapes that suddenly explode in hammering rhythms and surging anthems, wiping out musical expectations like a sudden wind blast. Throughout the five-part suite that composes June, there’s the same sense of organic development, each piece flowing naturally into the next. This time, though, the discourse is mostly kept on timbre and color, the music evolving from barely audible sounds to more concrete manifestations through intricate textural tapestries and a tight counterpoint of brief, incisive statements. Fujii and Agnel work both on the keys and inside the piano, expanding on the percussive backdrop created by Orins and Lasserre, all four avoiding more concrete harmonic or rhythmic developments. There’s also a good dose of humor on display, thanks to the unusual timbres created by Pruvost and the irreverent theatrics of Tamura – both absolute masters of extended techniques – who use a variety of mutes and different objects, from small percussions to children toys, to enrich the ensemble’s palette. 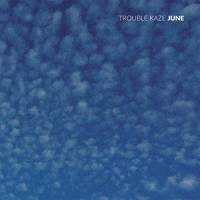 The contrast between these elements and the rigorous abstractness of the music has a refreshing effect, adding a slightly surreal atmosphere while maintaining an uncompromising musical integrity, confirming the original Kaze as one of today’s best improvising bands, and this new expansion definitely worthy of further developments as a working group.